Yoghurt can be simply described as the curdled form of milk. Yoghurt is formed when there is fermentation of milk. Milk has bacteria in it and when the milk bacteria ferment, they coagulate and thicken the milk. This thickened milk is the yoghurt and it has a creamy texture and a slightly astringent flavour. It is possible to make yoghurt naturally as well as commercially. Yoghurt is formed naturally when fresh milk is heated and left for a few hours at a temperature of 100 degrees F. While yoghurt normally sets in 4 to 7 hours, it can be left in the machine for a longer duration to produce tangier tasting yoghurt. During the process of commercial manufacturing of yoghurt, friendly bacteria are added separately. There are various types of yoghurt that have varying levels of fat. While it is mostly made from buffalo, cow or goat milk, yoghurt can also be made from camel milk and milk powder. The varieties of yoghurt include plain yoghurt, flavoured yoghurt, sweetened and frozen yoghurt. All these yoghurt varieties are available in low-fat, regular and non-fat variants, making it easy to choose the fat content of the yoghurt. Yoghurt can be easily prepared at home using the yoghurt making machines. There are several varieties of these machines and you can choose the brand and model depending upon your requirement and preference. While some machines can make large quantities of yoghurt in one batch, there are models that offer the preparation of ready-to-eat yoghurt cups. Using home yoghurt machines is an ideal way to cut on the impurities or pesticides that might exist in the yoghurt cups available in the market. Yoghurt is a highly healthy dairy product and provides several benefits. 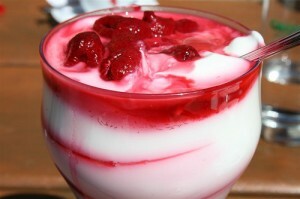 The best thing about yoghurt is that it can be used in a number of homemade recipes to produce some great concoctions.